After a quiet weekend, severe weather returns to the country today. Severe storms will be possible this afternoon and evening in the Mississippi River Valley from Minnesota to Missouri. An Enhanced risk for severe storms is in place for the Ozarks and northeastward into parts of Iowa and Illinois. This includes Kansas City and St. Louis, MO, and Overland Park, KS. Here, strong winds, large hail, and isolated tornadoes will be possible. 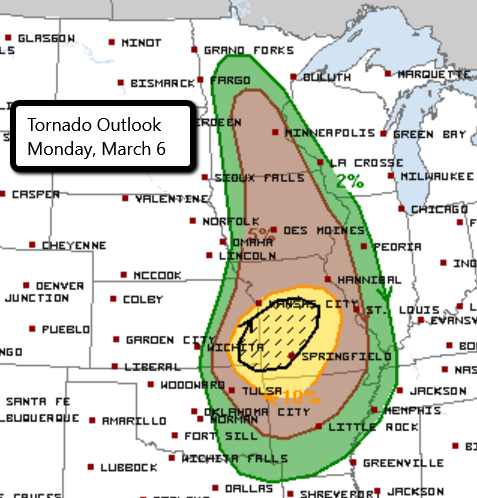 The greatest threat for tornadoes is in central Missouri and extreme eastern Kansas. A few tornadoes could be strong. 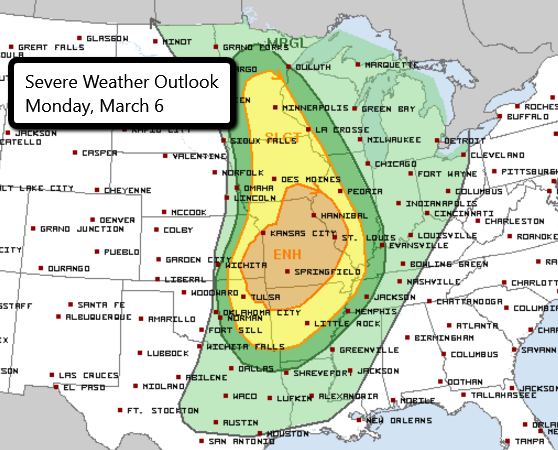 There is also a Slight risk of severe weather that stretches from southern Minnesota through Iowa and western Illinois into eastern Oklahoma and central Arkansas. Thunderstorms are likely here with a few strong storms possible that could produce damaging wind gusts and large hail. A tornado or two cannot be ruled out in these areas. Watch our chasers LIVE in the field here!